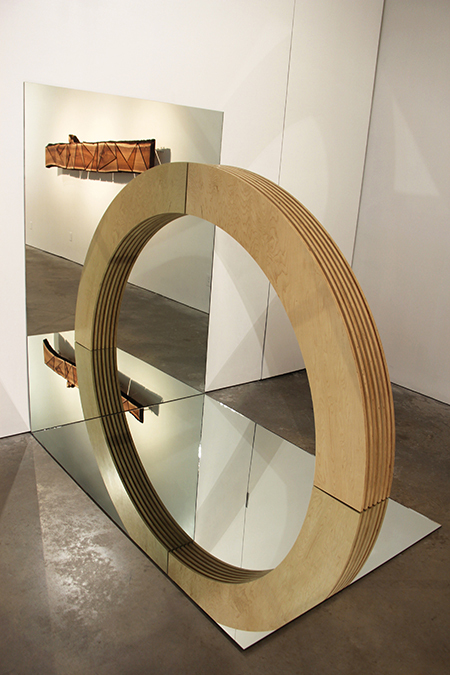 Ron Ulicny, "The Great Arc (Realization)," birch, lacquer and mirror, 6 x 4 x 6 ft.
Ron Ulicny exercises free rein in an installation and the results are impressive. The title, “Xylotheque," is taken from the Greek words xylong, meaning wood, and theque, meaning repository. Hence, the gallery has become a repository for large sculptures made from various types of wood that is manipulated in intriguing ways. Ulicny’s skill with wood and other complementary materials is clear in the major pieces “Sleepers (Here We Are),” “The Great Arc (Realization)” and “Ellipsification (Negativity)/Ellipticity (Positivity).” For “Sleepers,” he sanded, polished and coated the center portions of six railroad ties with polyurethane, which makes them look almost gilded in contrast to the roughly textured dark-brown ends. The ties are arranged parallel to one another atop a bed of dark-red lava rocks, evoking a short length of railroad track there to accommodate a ghostly train. “The Great Arc” places a constructed arc of lacquered birch on a mirror on the floor; thus the arc appears to be a complete circle. A second wall-mounted mirror reflects the illusory circle as well. Ulicny has been drawing, painting, and making sculpture all his life, but in an effort not to repeat himself, he continually experiments with unusual materials and techniques. In the past, he has assembled objects and cast-offs into intriguing sculptures, but for this show, he worked with wood, including white oak, red oak, walnut and pine. In “All Squares are Diamonds but not all Diamonds are Squares (Walnut),” Ulicny joins four triangles of polished wood with four triangles of polished steel to form squares, which he bolted together into a larger square, leaving a narrow space between the four parts. The result is an elegant diamond of black steel floating inside a lighter wooden square. Ulicny’s training as a designer at Tyler School of Art is apparent in the graphic nature of his work, and his experience working with a wide range of materials comes across in the precise nature of his sculptures.